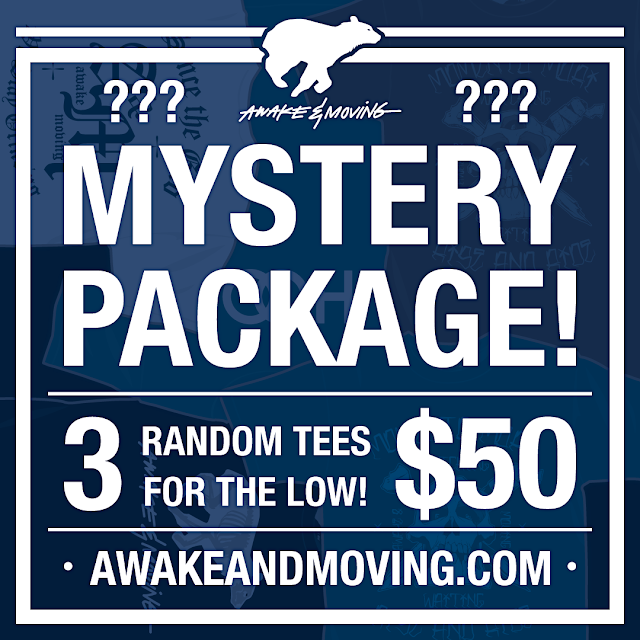 Awake & Moving: New Mystery Packages Have Arrived In The Online Shop! New Mystery Packages Have Arrived In The Online Shop! For the first time ever I'm offering a Mystery Package in the online store, just in time for holiday shopping. Including new and old styles. Three random tees, all one size, for only $50, plus a grip of stickers at no extra charge. It's like getting a free tee for buying two. Dopeness. I put up less than 10 of these in the shop. Like, half that, really. This is my way of saying thank you to all of my supporters and to help your pockets stay phat. Use that extra cheddar to buy yourself some used video games, take your bae out to see Rogue One, or support a fellow artist/brand like this one. We all need each other and I thank you for your continued support, and if you're new to this brand, welcome and enjoy the hookup!